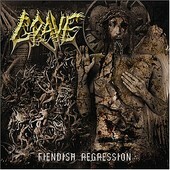 The veteran death metal outfit Grave's sixth release is a vicious array of doom metal riffs and death metal anarchy. An absolutely punishing low-end assault is what you find on Fiendish Regression, garnished with razor sharp guitar lines that dominate the entire nine-track affair. These seething Swedes triumphantly walk the line between the melodic and the depraved on cuts like the pulverizing "Awakening" and chunky gallop of "Out of the Light", reminiscent of Machine Head meeting Cannibal Corpse. Growling their way into your skull, Grave's ominous new release hits you like a sledgehammer to the gut and doesn't let up until the final scream of the brutal dirge "Heretic".